Lets get intimate and talk about personal calendar printing; create a unique gift for family and friends. Use your special images to create a personalised calendar that will bring enjoyment to the person who receives your gift. You may have relatives who live quite a distance from you? Maybe you have family who live abroad? Create a special one-off calendar with images of your children, pets, family photos; use holiday photos, images of events that have happened throughout the year like a family wedding. We can take your special personal images and transform them into an exclusive memorable gift. Personal calendars are easily sent through the post to your loved one’s, who on receipt of your calendar gift will cherish and keep for many years. Don’t forget those family members closer to home like parents and grandparents, they all love receiving personalised calendars as a gift, a calendar can be used as a present anytime of the year. Mother’s always enjoy receiving personalised gift, made even more special by receiving a personal calendar full of images of family members. Mum’s all over the world love having calendars, maybe in the kitchen to keep track of all those important family dates. 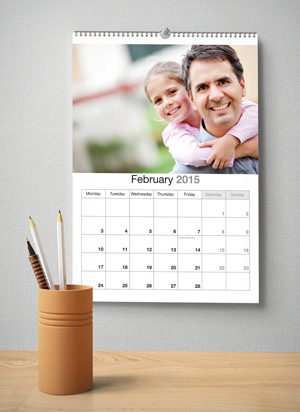 Calendars are used on a daily basis and to have great images of family makes it even more fun. You can give your calendar as a Mothers Day gift or Birthday gift; or just a gift to say thank you. Personal calendars can be created from your favourite images, we all take photos; these days we use digital cameras and smart phones. Images are taken and then normally end up on a hard disk somewhere, never to see the light of day again; we all do it. Take them off your computer and share them; turn them into a you’re very own calendar. The modern smart phones allow us to take photos anywhere why not embrace the technology; take a series of selfies and turn them into a selfie calendar, just a word of caution though; you want to check to make sure the resolution is high enough to produce a good quality image to be printed.